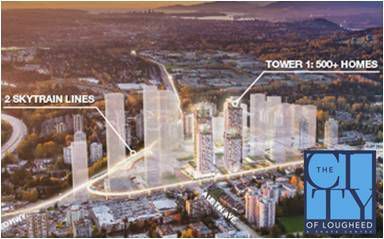 At the centre of Metro Vancouver, where two SkyTrain lines meet and the region’s largest highways converge, a rare 40-acre site will be dramatically reconceptualized into The City of Lougheed. Residents will experience an unparalleled urban lifestyle within a community designed for livability, ease and enjoyment. The streets will be filled with architectural and culinary inspiration from around the world, lush walkable boulevards and a never-ending array of shops, restaurants, sidewalk cafés, celebrations and cultural experiences, all in one remarkable place.